Calgary’s coffee culture is hot! New cafes are springing up everywhere and more than just chain shops, you can find some of the finest artisan speciality cafes anywhere. And Calgary’s Beltline offers some of the best (in alphabetical order). This ultra-chic cafe often has a lineup, and for good reason. The modern interior houses plenty of tables and a long coffee bar, but it’s the eye-catching shelf of old records that set a retro-modern tone. This unique cafe puts a twist on traditional coffee culture. At Boxcar, they serve local Phil & Sebastian coffee, plus wines and plenty of tasty food and treats, but it’s the array of board games ready for play that makes a visit to this Beltline spot entertaining. With brick walls, and big tables perfect for laying out Risk, Settlers of Catan, or Monopoly, Boxcar is worth a visit. Cafe Beano has been around for over 25 years and has been a hip, happening spot since long before cafes became trendy. Beano is known for its eclectic clientele, and it’s common to find millennials, seniors, hipsters and hippies all hanging out on the cafe’s iconic outdoor benches. Whether it’s the rough-hewn barnboard or the copper ductwork, this spot features a full variety of coffee drinks and tea blends. Rosso has numerous locations downtown and in the Beltline. This family-run business prioritizes sustainable beans from small producers in the developing world. Expect artisan coffee and espresso drinks, fresh pastries, and warm hospitality. Is Calgary’s Beltline where you belong? If you’re looking to move to a more urban, connected neighbourhood you should probably be looking at The Arch. It’s in the heart of Calgary’s Beltline. Plus it’s right on the bike path – connecting you easily to anywhere you need to go in Calgary. And great cafes are just one part of what all the neighbourhood has to offer. You’re walking distance to all the things you could possibly need or want. Best of all, it’s a great new building with modern units that all come with floor to ceiling windows and granite countertops. It’s the upgrade you’ve been looking for – with the perfect latte on the side. Create your own outdoor cafe at home. The only thing better than going out for coffee is having great coffee at home in your own personal oasis. When you live at The Arch, you’ll have it all. Imagine enjoying your coffee at a beautiful granite bar while you read the paper. Or perhaps you’d prefer your coffee on your balcony while you overlook downtown. What are you waiting for? 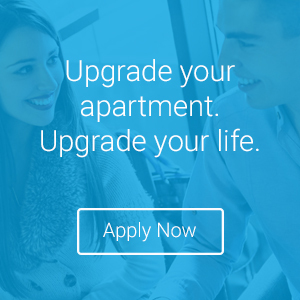 Spring is the perfect time to upgrade your apartment and upgrade your life.